Product Details Fits true to size. Semi-fitted silhouette. Sealed seams. Grey frost fox removable fur around hood. Grey rabbit fur lined hood. Snaps on leather tape front closure. Rib storm cuff. Double entry zipper and flap pocket. Hip length. Comfort zone down to -20o. 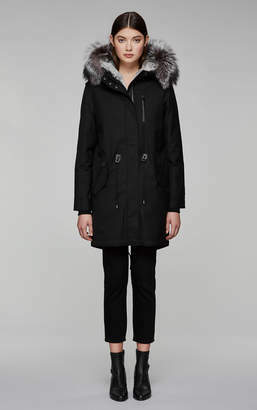 Coat length from shoulder to hem: 29" / 73.7cm Model is 5"11 / 180cm and is wearing a size XS. Shell (Woven): 65% Cotton, 35% Nylon. 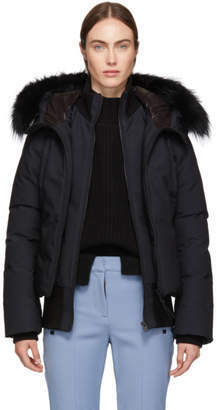 Lining (Woven): Body-Slvs:100% Nylon, Hood: Rabbit Fur (Oryctolagus Cuniculus). Filling: 90% Duck Down,10% Feathers (Pekin Duck, Anas Platyrhynchos Domesticus). Finland Blue Fox Fur (Alopex Lagopus). Water resistant & Water repellant. Dry clean by a leather specialist using oil based solvent only Do not use perchloroethylene. 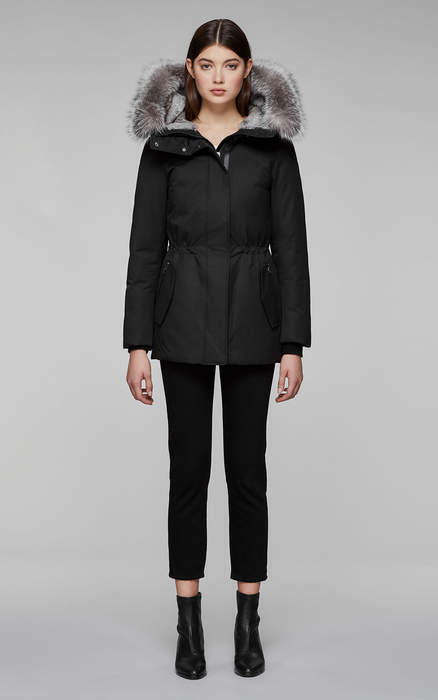 Description DANIKA-X by MACKAGE is a hip length, luxe down coat with a drawstring waist in a semi-fitted parka silhouette. Feel supreme warmth with a grey rabbit fur-lined hood with a removable grey frost fox fur collar. 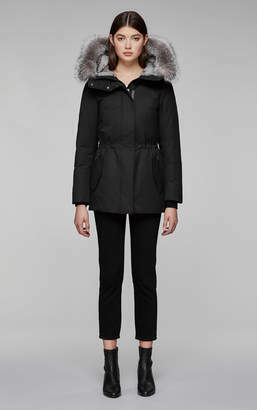 This down winter coat features a drawstring waist and storm cuffs to provide added protection, while the zip and snap front closure feature a leather pocket and closure trim. Double entry zip and flap pockets at front. Nickel hardware. Available in black and army green.